Proven tactics from veteran teachers. The authors have more than a decade of combined LSAT experience as classroom teachers, private tutors, curriculum developers, and prep-book authors. These techniques have been honed through years of practice in the field. A curriculum based on exhaustive research and analysis. Four different LSATs are administered every year. Three of those four exams are released to the public. As a result, more than 60 LSATs are now available to the general public for practice and review. The content and techniques in this book were developed based on a comprehensive review of thousands of the questions that have appeared on these real tests. Updated techniques to reflect a changing test. The LSAT is a dynamic test that evolves over time. Each year, new question types crop up while old question types fall by the wayside. The curriculum in this book has been written with a particular emphasis on capturing the newly emergent trends in the 15 publicly available tests that were administered between 2006 and 2010. We’ve developed techniques that will help you stay ahead of the curve on these new question types. A unique, casebook-style instructional approach. Casebooks and the case-based model of instruction are the backbone of the law school curriculum. This book is the only LSAT-prep book on the market that is written as a casebook. Major question types and key strategies and techniques are presented as separate cases for study. This model will help you organize your studying and make important material easier to digest and remember. The best practice tests on the market. Practice—and then more practice—is the key to success on the LSAT. But practice only helps if you’re practicing on questions that are similar to the ones you’ll encounter on the day of the test. The practice tests at the back of this book have been carefully designed to simulate actual LSATs as closely as possible. In addition, each practice test comes with a complete set of answer explanations that do more than simply tell you what the correct answer is and why the other four answers are wrong. They walk you through the process of arriving at the correct answer. This chapter is dedicated to the nuts and bolts of the LSAT. It will explain how to register for the test, introduce you to the structure and format of the test, briefly preview the types of questions you’ll encounter on each of the four sections, explain how you should approach test day, and help you develop a study plan. Chapter 2 offers a diagnostic test to show you where you are now in your preparation and help you determine which question types need the most attention. Techniques for tackling each section of the test are covered in detail in Chapters 3, 4, 5, and 6, whilechapter 7 provides an overview of the law school application process, including a discussion of the factors you should consider when deciding on where to apply and the logistics of submitting your applications. The LSAT is written and administered by the Law School Admission Council (LSAC), a nonprofit corporation that provides a variety of admissions-related services to its more than 200 members. In addition to overseeing the LSAT, the LSAC also runs the Credential Assembly Service (CAS). The CAS is a centralized law school admissions clearinghouse that allows you to apply to as many law schools as you’d like simply by filling out a standardized package of forms that are somewhat akin to the Common Application you may have filled out when you were applying to college. The LSAT is administered four times a year, in February, June, October, and December. The June exam is administered at 12:30 p.m. on a Monday afternoon. The February, October, and December exams are administered at 8:30 a.m. on Saturday mornings. For test takers whose religious observances prevent them from taking the exam on Saturdays, the LSAC offers a Saturday Sabbath observers administration, which typically takes place on the Monday following the Saturday administration. To be eligible for a Saturday Sabbath observers administration, a test taker must submit a letter from his or her minister or rabbi on official stationery. The best way to register for the LSAT is online. Go to http://www.lsac.org/jd/LSAT/about-the-LSAT.asp and click on the purple button at the top of the page that says “Register Now.” To register online, you will have to create an LSAC.org account. There is no charge to create an account, and it is the same account you’ll use to register for the CAS and submit online applications for admission. You can also register for the LSAT over the phone by calling 215-968-1001 on weekdays during East Coast business hours. But since you’ll inevitably need to create an LSAC account at some point during the application process, it makes better sense to go ahead and get set up online now. Once you know when you’d like to start law school, select a test date that’s well in advance of your enrollment date. December is the last test administration date that most law schools will look at for fall admissions. For example, if you want to begin law school in the fall of 2014, the latest possible date you could take the LSAT would be December 2013. But you’ll help your chances for admission by taking the test earlier—preferably no later than June of 2013. Chapter 7 will explain in greater detail why taking an earlier test will improve your chances for admission. Once you’ve selected a test date, register for it as early as possible. When you register, you will have to pay a $165 fee and you’ll be asked to select a testing site. The seats at each testing site are given on a first come, first served basis. Wait too long and you run the risk of being forced to take the test at an inconvenient location. Make sure you’ve thought over where you want to take the test before you register. If you decide later that you want to take the test at a different location, you’ll have to pay a $36 change fee. The registration deadline is typically about five weeks before the day of the test. The late-registration deadline is 7 to 10 days after the first deadline, and you’ll have to pay an additional $70 fee. You can find more information about the registration deadline for a particular test date by visiting http://www.lsac.org/JD/LSAT/test-dates-deadlines.asp. The LSAT is not a content-based test. Rather, it is a skills test made up of six 35-minute sections. It is designed to measure your acquired abilities in the areas of reading, verbal reasoning, and spatial reasoning. The score you receive on the LSAT will be based entirely on your performance on the following four sections. These sections contain somewhere between 99 and 103 multiple-choice questions, each of which includes five answer choices. The fifth multiple-choice section you take will be an experimental section. This section does not count toward your score; the LSAC uses these sections to design future LSATs (that’s right, you get to pay for the privilege of being a research guinea pig). Your experimental section could be Logic Games, Reading Comprehension, or Arguments, and you won’t necessarily get the same experimental section as the person sitting next to you. The LSAC uses multiple experimental sections during each test administration. You won’t know which particular section was experimental. If you have three Arguments sections, for example, all you’ll know is that one of the three won’t count toward your score. These five sections can be presented in any order. After you’ve taken the first three sections, you’ll get a short break of about 10 or 15 minutes so that you can go to the restroom, stretch your legs, or have a quick snack. After the break, you’ll take the final two multiple-choice sections. The administrators will collect your test booklet and your answer sheet. Then they will administer the sixth section—the Writing Sample. The Writing Sample section always comes last. It is the only section of the LSAT that isn’t multiple choice. And like the experimental section, it also is not scored. The LSAC simply scans your answer and sends a copy of it along with the rest of your application materials to every law school you apply to. The LSAT is scored on a 120-to-180 scale. Your scaled score is based on your raw score. Your raw score is the number of multiple-choice questions you answered correctly in the four scored sections. Each question counts for one point, and there is no penalty for wrong answers. For each administration of the LSAT, each raw score (ranging from 0 to 103) is assigned a particular scaled score. Your scaled score is essentially a percentile ranking. The LSAT is designed so that scaled scores mean the same thing from test to test. For example, no matter what test you take, if you get a 158, you answered more questions correctly than 75 percent of the people who took the same test you took, and you answered fewer questions correctly than 25 percent of the people who took the same test you took. The chart below summarizes the estimated percentile rankings of various LSAT scores. The raw score that is assigned to a particular scaled score varies from test to test. For example, a 163 is the scaled score that puts you in the 90th percentile of all test takers. On some tests you need a raw score of 83 to get a scaled score of 163. On other tests, it takes a raw score of just 77. These variations result from the fact that some tests are harder than others, but since the LSAT is scored this way, you don’t have to worry about that. You’re scored relative to the people who took the same test as you. Since no points are subtracted for wrong answers, you should not leave any questions blank. If you have no idea what the answer is (or if you don’t have time to attempt all of the questions in a section), bubble in a random letter; do that five times and odds are you’ll get one question right. It doesn’t matter whether you bubble in different letters or choose one letter and bubble it in every time you guess. Just make sure you’ve bubbled something in for every question. One final note about the scoring scale that’s important to keep in mind as you study. As you can see from the chart above, a person who gets a 178 only did 0.9 percent better than a person who got a 173, but a person who gets a 158 did nearly 20 percent better than a person who got a 153. Law schools care about those percentile differences. So don’t get discouraged if, after a few weeks of studying and working practice problems, your score has only gone up three or four points. Every point makes a difference to your admissions prospects. Below is a brief introduction to what you can expect from the Logic Games, Arguments, Reading Comprehension, and Writing Sample sections, each of which is covered in greater detail in a subsequent chapter. Each Logic Games section contains four “games.” You will be asked to answer between five and seven questions about each game. Most Logic Games sections have 23 questions. Below are the actual directions that appear at the top of the Logic Games section. These directions are the same on every test. Read and learn them now so that you don’t have to spend any time reading them on the day of your test. So what is a logic game? A logic game consists of two parts: the setup and the clues. The setup is the fact pattern; it provides you with the basic information that you’ll be working with as you work the game. That basic information consists of a list of elements and a task to perform with those elements. The clues are rules, conditions, and constraints that organize the elements and define and limit the ways in which you can use the elements to perform the task you’ve been assigned. The clues appear in a list underneath the setup. There are only two basic tasks that you will have to perform on the Logic Games section: ordering (putting the elements of the game in sequential or chronological order) and grouping (assigning the elements of the game to one or more groups or teams). That’s it. Some games will involve both ordering and grouping, but those are the only two things you have to learn how to do to successfully navigate the Logic Games section. The best way to perform these tasks is to draw a simple diagram and use it to keep track of all the information in the setup and the clues.Chapter 3 will teach you how to identify the task that a particular game requires you to perform, create a diagram that keeps track of the information, and systematically work your way through the questions. For most test takers, the Logic Games section is both bad news and good news. The bad news is that it’s probably the section of the LSAT that is the most foreign to you. While we all have at least some experience with reading academic essays and analyzing short arguments, the task you’re asked to perform on the Logic Games section—understand and visually represent the logical relationships between a set of variables—is likely an unfamiliar one. The good news is that your inexperience and unfamiliarity won’t hurt you. Not only are all of your fellow test takers in the same boat, but Logic Games is the most teachable section of the LSAT. With a smart approach and consistent practice, most LSAT students can dramatically improve their performance on this section of the test. Directions: The questions in this section are based on the reasoning contained in brief statements or passages. For some questions, more than one of the choices could conceivably answer the question. However, you are to choose the best answer; that is, the response that most accurately and completely answers the question. You should not make assumptions that are by commonsense standards implausible, superfluous, or incompatible with the passage. After you have chosen the best answer, blacken the corresponding space on your answer sheet. Each argument is relatively short: three or four sentences or about 100 words. You’ll be asked to answer one question about each of the arguments. Although older LSATs sometimes asked two questions about a single argument, more recent exams have consistently stuck with a one-to-one ratio. The arguments are drawn from a variety of sources and address a wide range of topics. Typically the content is academic in nature, with a heavy emphasis on the natural sciences, psychology, economics, and ecology. No preexisting knowledge of these topics is required to answer the questions. The questions pertain solely to the information presented in the arguments. The question types in the Arguments section test one or more of the following three skills: (1) understanding the content of an argument; (2) identifying a gap where information is missing from an argument; and (3) analyzing the reasoning of an argument. In Chapter 4 you’ll learn how to identify each of the major question types that you’ll encounter in the Arguments section. You’ll take a slightly different approach to reading and analyzing the argument depending on which skill the question is testing. The arguments themselves and the right and wrong answers exhibit consistent, predictable patterns. Familiarizing yourself with those patterns will help you answer the questions faster and with a higher rate of accuracy. Directions: Each set of questions in this section is based on a single passage or pair of passages. The questions are to be answered on the basis of what is stated or implied in the passage or pair of passages. For some of the questions, more than one of the choices could conceivably answer the question. However, you are to choose the best answer; that is, the response that most accurately and completely answers the question, and blacken the corresponding space on your answer sheet. Every Reading Comprehension section contains one passage from each of the four following general topic areas: (1) law, (2) hard science, (3) fine arts, and (4) social sciences or the humanities. The level of difficulty depends less on the topic of the passage and more on the density of its language and the complexity of its structure. Three passages will be a single piece of writing between 420 and 550 words long. The fourth passage will be a pair of shorter excerpts between 200 and 275 words each. This pair of shorter excerpts is known as the comparative-reading passage. The Reading Comprehension section is fundamentally a test of information retrieval. It doesn’t require you to go beyond the text of the passage by thinking critically about it, analyzing it, or pondering its broader implications. The questions test your ability to understand what you’ve read. In Chapter 5 you’ll learn that you should not rely on your memory or recall of the passage when answering the questions. Instead, you should go back to the passage, reread the relevant portion, and find the answer to the question in the passage’s text. With practice, this simple but powerful technique will yield a dramatic improvement in your performance on the Reading Comprehension section. The final section of the LSAT is the writing sample. After you’ve finished all five multiple-choice sections, you’ll have to write a two-page, handwritten essay in response to a brief factual prompt. The prompt will describe a factual scenario in which a person is presented with some kind of decisional problem. The prompt will describe two goals that the person hopes to accomplish. The prompt will also present two possible options for how the person might attempt to accomplish those goals. Using the facts that are included in the prompt, your task is to write an essay that selects and defends one of the options as a superior choice in light of its ability to better accomplish the two enumerated goals. Directions: The scenario presented below describes two choices, either one of which can be supported on the basis of the information given. Your essay should consider both choices and argue for one over the other, based on the two specified criteria and the facts provided. There is no “right” or “wrong” choice: a reasonable argument can be made for either. Although the writing sample does not contribute to your LSAT score, it is read by law school admissions officers. You don’t want an officer who is on the fence about your application to read a poorly written essay. Start thinking about the writing sample about a week or two before you take the LSAT. Chapter 6 introduces a five-paragraph structure you can use to write an effective essay. As the date of your LSAT draws closer, there are a few practical things you should do to prepare. First, visit the location where you’ll be taking the test. Figure out how you’ll get there, how long it will take, and where you’ll park (or which public transportation stop you’ll use). Having this all nailed down in advance will reduce your stress level on the day of the main event. Two nights before the test, be sure you get a good night’s sleep. You should try to get a good night’s sleep the night before the test, too, but sometimes nervous energy makes that impossible. That’s OK—you can overcome one bad night of sleep and still be alert and focused. But if you’ve had two nights of bad sleep in a row, your test-day performance will suffer. So make it a point to turn in early on Thursday night (or Saturday night if you’re taking the test in June). The night before the test, take it easy. Don’t stay up late working practice tests, trying to learn new material, or intensively reviewing material you’ve already learned. By this point, you know what you’re going to know. One last cram session is more likely to make you feel tired and discouraged than help your performance. Take a moment the night before the test to assemble everything you’re going to bring with you to the test. There are only three things that you absolutely have to bring: (1) your admissions ticket; (2) a photo ID; and (3) number 2 pencils. When you register for the LSAT, the LSAC will send you an admissions ticket. It will be e-mailed to you if you register online and mailed to you if you register by phone or mail. They won’t let you into the testing room if you don’t have this admissions ticket. For the photo ID, a driver’s license or a passport will work. And yes, you do have to use number 2 pencils; mechanical pencils are prohibited. Bring a handful with you, and make sure they are sharpened. A small, nonelectric pencil sharpener. A white eraser stick. White erasers work much better than the pink erasers that are attached to the ends of number 2 pencils. If you need to change an answer on your Scantron, clean and complete erasure will make sure that the scoring machine reads your answer sheet correctly. Pain relievers. Grab a few ibuprofen, aspirin, or acetaminophen, just in case. A snack. You’ll want something to eat during the 10- to 15-minute break. A bottle of water. You won’t be allowed to leave the test room to get a drink while the test is being administered. A jacket, sweater, or fleece. The test proctors typically will not be able to control the temperature in the test room. Dress in layers so that you won’t be hot if the room is a little stuffy or cold if the air-conditioning is cranked up too high. An analog wristwatch. Digital timers are prohibited. So are analog stopwatches. If you want to keep track of time for yourself, you’ll have to use an analog wristwatch. And it’s a good idea to plan to do this: you won’t necessarily be able to see a clock in the testing room, and you’ll want to keep an eye on your time as you’re working. A large Ziploc bag to put all this stuff in. That’s the only kind of container you’re allowed to bring into the testing center. For a complete list of items that are prohibited from the test room, visit http://www.lsac.org/JD/LSAT/day-of-test.asp. On the morning of your test, stick to your normal routine. Eat the same kind of breakfast you normally eat, and drink the same amount of coffee or soda or whatever it is that you normally drink. Studies show that test takers perform better if they’ve had a healthy breakfast, but if you never, ever eat breakfast, today’s not the day to start. 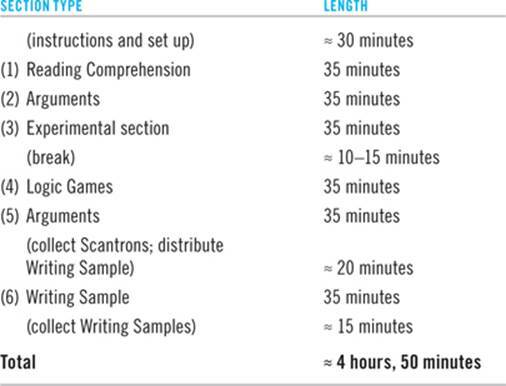 Before you go to the test center, take 10 or 15 minutes to review some test materials. Look over one Logic Game, one Reading Comprehension passage, and one two-page set of Arguments questions. Do not work new practice problems. Instead, review problems that you’ve already worked (preferably ones that you did well on). The purpose of this review is to get your brain awake and warmed up. And reviewing problems that you answered correctly will help you put yourself into a positive, confident state of mind. Be on time. The start time will be printed on your admissions ticket. The test proctors will close the doors precisely at that time. If you’re late, they won’t let you in, and you’ll forfeit your opportunity to take the LSAT that day. You can expect to receive your score by e-mail about three weeks after the test. If you’ve registered with the LSAC, the score will be e-mailed to you free of charge. If you don’t have an LSAC account, or if you would prefer to have a hard copy mailed to you, you’ll have to pay a fee of $25. Hard-copy score reports are usually mailed about a month after you take the test. For specific information on the score release date for the test you’re taking, visit http://www.lsac.org/JD/LSAT/test-dates-deadlines.asp and click on the link for your test date. If you feel that the test has gone poorly, you’ll have two opportunities to cancel your score. First, you can cancel your score on the day you take the test. Your LSAT answer sheet will contain a section allowing you to cancel your score. Instructions on how to do so will be provided. Second, you can cancel your score by mailing or faxing in a score-cancellation sheet within six days after you take the test. It never makes sense to cancel your score on the day of the test. Plenty of people get freaked out and have a crisis of confidence while they’re taking the LSAT (especially if they have the misfortune of drawing an experimental section in which the LSAC is road-testing a batch of its most difficult questions). If you finish your test and feel like it’s gone poorly, do not cancel your score that day. Go home, blow off some steam, get a couple days’ distance from the test, and then revisit the issue Monday morning (or Wednesday morning if you take the test in June). Once you’ve gotten some perspective, you may remember other sections of the test that you felt really good about. Or you may talk to a friend who took the test the same day, hear that she didn’t have the same brutally hard Games section that you had, and realize that the section you struggled with was the unscored experimental section. By waiting to make the keep-or-cancel decision, you’ll prevent yourself from doing anything rash. And there’s no risk associated with waiting. All you have to do to cancel your score after the fact is fill out a one-page form and either mail or fax it to the LSAC. You have six days to do this. Since you can fax the form in, you can guarantee that it arrives on time. If you do decide to cancel your score, more information on how to go about doing so is available at http://www.lsac.org/JD/LSAT/lsat-cancellation.asp. If you get a score you’re unhappy with, you’re free to take the LSAT again (up to a maximum of three times in any two-year period). If you take the LSAT multiple times, the LSAC will report all of your scores to each law school you apply to. The LSAC will also provide an average of all your scores. The decision on which score to consider varies on a school-by-school basis. Some schools will only consider your highest score; others consider the average of all your scores. If you’re thinking about taking the LSAT for a second time, it’s worth it to call the admissions offices at the law schools you’re most interested in and ask them what their policy is on reviewing applications with multiple LSAT scores. You’ll get a lot more bang for your buck as a second-time taker if you’re applying to schools that are willing to look only at your highest score. It’s much harder to make a big upward jump at a school that averages scores.